Do you have to start teaching a second language from birth? Does it help to get a nanny who speaks a second language? Is there any way your child will retain the language you speak even though you’re currently in a country where another language is dominant? Does learning a second language lead to any developmental advantages beyond just the benefits of learning the language? Several listeners have actually written to me requesting an episode on this topic, and one has been particularly insistent (you know who you are! ), so I was very glad to finally find an expert! Dr. Erica Hoff leads the Language Development Lab at Florida Atlantic University and studies language development and bilingualism in children. She gives us the lowdown on the best ways to raise a bilingual child (and doesn’t mince words on how difficult it is) – and also answers my burning question: I’m not planning to teach my daughter a second language at the moment, so am I a terrible parent? Bridges, K., & Hoff, E. (2014). Older sibling influences on the language environment and language development of toddlers in bilingual homes. Applied Psycholinguistics 35, 225-241. Core, C., Hoff, E., Rumiche, R., & Señor, M. (2013) Total and conceptual vocabulary in Spanish-English bilinguals from 22 to 30 months: Implications for assessment. Journal of Speech, Language, and Hearing Research, 56, 1637-1649. Hammer, C.S., Hoff, E., Uchikoshi, Y., Gillanders, C., Castro, D.C., & Sandilos, L.E. (2014). The language and literacy development of young dual language learners: A critical review. Early Childhood Research Quarterly 29, 715-733. Hoff, E., Rumiche, R., Burridge, A., Ribot, K.M., & Welsh, S.N. (2014). Expressive vocabulary development in children from bilingual and monolingual homes: A longitudinal study from two to four years. Early Childhood Research Quarterly 29, 433-444. Hoff, E. & Core, C. (2013) Input and language development in bilingually developing children. Seminars in Speech and Language, 34, 215-226. Menjivar, J., & Akhtar, N. (2017). Language experience and preschoolers’ foreign word learning. Bilingualism: Language and Cognition 20(3), 642-648. Ribot, K.M., & Hoff, E. (2014). “Como estas?” “I’m good.” Conversational code-switching is related to profiles of expressive and receptive proficiency in Spanish-English bilingual toddlers. International Journal of Behavioral Development 38(4), 333-341. Jen: 00:37 Hello and welcome to the Your Parenting Mojo podcast. I’m very excited today to welcome my guest, Dr Erika Hoff, who is Professor and the head of the Language Development Lab at Florida Atlantic University. Several of my listeners have emailed over the last few months and I’ve asked questions about raising bilingual children, but I was having a hard time finding someone with expertise in this area. One listener has been particularly insistent with his questions on this topic; you know who you are. So when a friend of mine forwarded in New York Times article about raising bilingual children that quoted Dr. Hoff, I reached out that very same evening to ask her to be a guest on the show and I was delighted when she wrote back immediately and agreed to speak with us. Dr Hoff obtained her Ph.D from the University of Michigan on the topic of Developmental Psychology with a thesis that focused on the influence of maternal speech on children’s language development. Her Language Development Lab studies, the human abilities and experiences that contribute to language development. Jen: 01:31 Our main focus is a longitudinal study of English monolingual and Spanish English bilingual children from two and a half to 10 years of age and she’s looking for evidence of factors in children’s early language experiences and early language development that predict successful oral language and literacy outcomes. Welcome Dr Hoff. Dr. Hoff: 01:50 Thank you very much. Jen: 01:51 So I guess let’s kind of start down in the weeds here a little bit. I want to ask it a bit of a methodological question because I know a lot of the research on dual language learners is on individuals who are perhaps the children of immigrants and who are learning English as a second language, maybe out of necessity as part of living in an English speaking country and I’m curious as to how much of the research is on those kinds of bilingual children and how much is on native English speakers who are interested in exposing their child to a second language that maybe is not quite necessary, not quite as necessary as learning English. Does the research transfer back and forth easily? Or are there some findings that are applicable to one of those populations and not the other? Dr. Hoff: 02:31 Well, to answer that question, I have to tell you a little bit about the different populations who are bilingual and the different fields that study bilingualism. There is a big field of second language acquisition. Most of that looks at older children and adults and studies foreign language instruction, and you’re not talking about that. If you’re talking about young children acquiring a second language or even more to the point of your question, if you’re talking about babies becoming bilingual by being exposed to two languages, then really none of the systematic research is about the group that you’re talking about. It’s not about middle class children born in the United States whose parents try to organize a bilingual experience for them and the reason is that there is no common experience that these children have. There are books written by parents who have done this with their children. Dr. Hoff: 03:44 There are books written about other people’s experience with this, but they are really a collection of anecdotes. The systematic research is either on immigrant populations because there are enough people in the same circumstance that you can do a study. There are also studies of bilingual development in more bilingual parts of the world. So in Wales where there are many Welsh-English bilinguals; in Spain where there are Spanish-Cataln bilinguals; in Canada where there are French-English bilinguals. So the research is not just about immigrant populations, but in the United States. The people who are bilingual are either immigrants, children of immigrants, or are these one off kinds of circumstances that don’t admit of systematic research very well. We just have stories of what’s possible and what works. But in terms of a study with large numbers of children, it simply doesn’t work. Jen: 04:54 Yeah. Anecdata is my favorite kind of data. So then how can we extrapolate from the kind of research that you do on immigrant bilingual children and it, is it possible to extrapolate that to a middle class audience is looking to give their child a different experience? Dr. Hoff: 05:11 Well, I think there are some findings that should inform the effort to raise a child that’s bilingual. So one of the findings from the children I study, and these are children who are exposed to two languages from the time they are born and some people might think and some people even say, well, if you’re exposed to two languages from birth, then of course you will become a bilingual because babies have this amazing ability to acquire language. Now, I don’t disagree about the amazingness of babies, but it turns out from my research and other people’s research agrees with this, that just because you’re exposed to two languages from birth doesn’t mean you’re going to end up speaking two languages as a bilingual adult. You really have to have an environment that supports both languages and that continues to support both languages over the course of development. A little bit from birth, doesn’t result in adult kinds of proficiencies in two languages. Dr. Hoff: 06:26 And what we see and children who come from Spanish, English bilingual homes is they started out much more bilingual than they end up. A very, a very common pattern is for the children’s Spanish to be pretty minimal by the time they are adults. Even among people who you would call bilinguals, that is they use both languages. There are many people here in south Florida who use both languages on a regular basis, but if they only heard Spanish at home, they never went to school in Spanish, their Spanish skills are not at the same level as their English skills. They’re not at the same level as a person who’s been educated in a Spanish speaking country. Jen: 07:08 Because you never picked up that vocabulary around all the topics. You were educated in; is that right? Dr. Hoff: 07:14 Yes. That’s certainly one component of it, but we also see before children are five. We see them becoming less bilingual than they were when they were two, simply because the amount of English they hear starts too overwhelmed with the amount of Spanish they here because the children know that English is sorta cooler, more prestigious event Spanish and so the children would prefer to speak English and all these things contribute to English, kind of swamping a Spanish and there are other environments where this doesn’t happen so much. If you look in Wales or in Canada where the difference between the two languages in terms of prestige is not quite as stark as the Spanish-English contrast is here. You see that to kind of environment that seems to support bilingual development better, but but it’s always the case that to acquire a language, you need a great deal of exposure to that language. You need to use that language and you need to do so on a continuing basis. Jen: 08:29 Okay. All right. Well thank you for that helpful overview. I wonder if we can kind of go back and start at the beginning now. So how do children start to learn language? Because I read that infants can essentially perceive sounds from all languages, but by around a year or so, they’ve kind of tuned out the languages that they don’t hear around them and I’m wondering if if a non-native speaker speak to second language to a child, does the child grew up with pronunciation errors? Does it matter what language do siblings use to speak to each other? How does that come together in very young children? Dr. Hoff: 08:59 Oh, okay. You’ve asked many questions there, so let me try to tackle them. How could children start to learn the language? Well, they start to learn a language to the extent that we understand the process by hearing it and by analyzing the patterns in it. Okay. To take a huge body of research and summarize it in one sentence: children learn patterns. They learn patterns of sounds that are different sounds that are tied to different circumstances, which means the different towns have different meanings and those are the building blocks. Now, in order to do that, you have to be able to tell sounds apart. If all sound sounded the same, there would be no language and we all know when we hear accent, someone who speaks with an accent, a foreign accent, that different languages make use of different sound contrasts. Dr. Hoff: 09:53 So probably the most famous and hilarious example in the movie Lost in Translation is Japanese speakers who learned English as an adult have a hard time with the contrast between the L sound and the R sound. Because in Japanese there are no words that differ just in terms of that sound. This is the kind of thing that babies learn to to now. So babies do not learn to tune out a whole language, but they do learn to ignore little differences that don’t matter for their language. And of course that’s very important. That is the differences between speakers. So when your father says baby and when your mother says, baby, the sounds are a teeny bit different and it’s crucial that babies learn to ignore those differences. So babies are very good at picking up the differences that matter and the differences that don’t matter. And if a difference doesn’t matter in your language, you sort of learned to not hear it, but you don’t tune out the whole language at all. Dr. Hoff: 10:59 Now in terms of non native speakers, it’s interesting. I think we don’t really know how a non-native accent effects early speech sound learning. It could, but children of immigrants do not end up speaking with accents. Children who are bilingual have a little bit of a bilingual accent. I mean it’s a subtle thing, but children sound like their peers and that’s an interesting phenomenon right there. Jen: 11:30 My daughter asked me the other day, a Mama, is it tomato or tomato? Yes. Well she must. She’s hearing tomato all day at school. New Speaker: 11:39 Yeah. Right. So. So she must be small. Jen: 11:43 Yeah, she’s three. Dr. Hoff: 11:44 Okay. Well, when she’s a teenager she won’t ask you. She will tell you that you’re saying it wrong. Jen: 11:49 I know, yes, I’m. I’m ready for that day. Dr. Hoff: 11:54 Perhaps even a little bit sooner, but to go back to the topic of non native speakers, one of the things that we have learned from our research is that it’s very important to hear a language from native speakers. If you asked the question, what are the circumstances that promote language development? Hearing a lot of the language is important, but hearing it from a native speaker is also important and it’s not just because of the accent. I don’t know if the accent is that important to tell you the truth, but when someone speaks a language that’s not their native language, they don’t use it in quite the same way. Even talking to a small child, we have research that is has been published and evaluated by outside reviewers that shows that hearing the language from native speakers is important and now what we’re working on right now is looking at what are the characteristics of native and non-native speech to children that explain this difference and it’s really interesting. Dr. Hoff: 13:03 We find even in fairly proficient non native speakers, the grammar is not quite as complex. The vocabulary is not quite as diverse. Even talking to a two-year-old, you don’t model as rich a language if it’s not your native language, so, so we think a really important conclusion from this work is that not that you should never speak your non-native language to your child, but that you should speak the language that you’re most comfortable speaking. Often parents – the parents in the research I do who are immigrant parents get told by classroom teachers and by pediatricians that they should speak English to their children and the people who give this advice mean well, and they’re correct in that children will have to learn English to be successful in school, but having an immigrant parent who is not very proficient in the language speak English is not the best use of anybody’s conversational time. Dr. Hoff: 14:11 The children would be better off hearing rich, informative Spanish from their Spanish-speaking parents and getting their exposure to English from a native speaker in some other way. Oh, and you asked about siblings, and I did. It does matter what we now siblings are not as good as source as parents. That is the way children talk to other children is not quite as attentive and responsive and informative as the way an adult talks to a child, but children to learn from the speech of their siblings and again, siblings – well we have. We found in one study that children with an older sibling that is two year olds with an older sibling who goes to school are much more English dominant and much less likely to hear Spanish at home. Once the kids go off to school in English, the whole household becomes more English oriented. Jen: 15:11 So now we’re sort of getting to the crux of the questions that my listeners have been peppering me with. So let’s just say for the sake of argument that I’m the parent of a normally developing child. Maybe she was around a year old, maybe she’s even a little bit younger and I want to start exposing her to Spanish or Mandarin or whatever other language I think is going to be critical in the world in the future. And let’s say that one of the parents speaks the second language fairly well maybe with a native accent, although he just learned from you that the accent is maybe not the critical thing, it’s the vocabulary that’s more critical and the other one doesn’t speak it at all. So we don’t really ever use that second language at home. So I guess sort of tackle these questions kind of one by one. Is there any benefit to the child of being exposed to that second language? Dr. Hoff: 15:54 Any benefit, you know: if it’s fun. If you know nursery rhymes and songs and things and you enjoy doing it and the child enjoys doing it, then sure. It’s not as though every minute of the day has to be some kind of cognitive development exercise, but don’t think that your child is going to end up bilingual by virtue of that activity. If it’s hard for native Spanish speaking parents to end up with a child who speaks Spanish, then really that kind of tells you that acquiring two languages is a project. It takes attention. And when you read the books and the anecdotal evidence of people who have been successful at it, the whole household is organized around making sure that both languages get used and gets spoken. It does not happen easily. I don’t think anybody who has successfully raised bilingual children will say it happens easily. They are quite proud of the lengths they went to to organize their children’s lives so that they would be exposed to both languages and would be put in situations where they need to use both languages. Jen: 17:15 Okay. So that speaks to the amount of effort that it takes. So I assume it would be better to start from birth and is there a time when you just kind of get to the point where you say, you know, I have a three year old, it’s just too late to worry about this now. Dr. Hoff: 17:28 We don’t really know from research, so I’m going to give you my best answer, my best guess based on what I do know. There is no point at which it is too late in terms of the brain’s capacity to learn a language. Younger is always better, but the way in which younger is better than older when you’re three is really a very subtle sort of thing. I mean, I can take an adult and put electrodes on their head and tell if they learned the language before the age of three or after, but we’re talking about you know, that level of difference. You can be very, very competent in a language even in terms of accent, but you were only exposed to at three. Here’s the problem with later exposure. The later you expose a child to a second language, the better they are in the first language so you have this problem that you’re trying to get a child to use the language they’re not very good in when they really are very good in the other language, and this has been demonstrated in looking for age of arrival effects in childhood immigrants. Dr. Hoff: 18:44 If you are an immigrant when you are five years old, you’re much better off learning the new language than if you’re an immigrant when you are 10 years old, not just because of some mysterious thing that happens in the brain, but because if you’re 10, you already know how to read in the original language, you’re not going to switch over as easily as a five year old will switch over to the new language and that’s research that someone in New York named [unintelligible] has done with the Chinese speaking immigrants, so younger is better, but not just because the brain’s capacity for language acquisition is better at a younger age. An awful lot of what influences the success of second language acquisition or a simultaneous bilingual development is not in the brain; it’s in the environment. What’s hard about becoming bilingual is getting the kind of language, exposure and opportunities for language use that you need. The brain can do it, but the brain doesn’t easily get the experience it needs. Jen: 20:01 So let’s say that I am very committed to my child learning a second language. How can I begin during this and these are the kinds of questions that parents email me with. They say, should I start reading books to her in the second language or books with English as well as the second language side by side, should I use second language translations of books she already knows or would that confuse the heck out of her? Should I hire a nanny who speaks the second language? And when I was doing research for this episode, I found a brand new study actually that shows that Spanish speaking babies who were given just one hour of English “sessions:, it didn’t get much more information than that. Uh, in a daycare setting, it learned more English than babies who didn’t. But the researchers, I only looked at those babies for 18 weeks and I’m. It doesn’t seem as though from what you’re telling us, that that knowledge would really stick long term once the baby leaves that program. So given that, that suite of potential things that a parent could do as well as any others you’re aware of, what are some of the ways that parents who are interested in doing this can introduce a second language? Dr. Hoff: 20:56 Okay. First of all, if you are not a very good speaker of the language, then you should do nothing. You should find somebody who is a native speaker. If I were in that position, what I would be looking for is an educated nanny. Because you need someone who’s a native speaker, but you need someone who’s a native speaker of the kind of Spanish or Mandarin or whatever language it is that you want your child to be acquiring. There are huge differences in how adults talk to children depending on their own level of education and so you want the person who is providing the language exposure to your child not only to be a native speaker but to be an educated native speaker and of course with enough money nannies of that sort can be found, but it’s important to say not any old person can do this. Dr. Hoff: 21:53 I read this study that you are talking about where the Spanish babies got an hour of English. They got an hour of concentrated playing and attention in English by college-educated native speakers of English, and they got an hour every day for 18 weeks. I could learn a lot in that time. And this was a special program, they did it for 18 weeks and then the project was over and without maintenance I would bet a lot of money that it’s not going to stick with, you know, which is not necessarily bad if everybody’s having fun, but if if your counting on that magically turning your child into a bilingual, you will be disappointed. Dr. Hoff: 22:44 I will say if, if you find a school that gives your child concentrated exposure to a second language provided in one to one or small group interaction with an educated native speaker for an hour a day on a continuing basis. That sounds great. I don’t know any such a program for babies. I mean you’re talking about something that has to be hugely expensive and again, you need a commitment to it. Eighteen weeks is probably fun, but it’s not going to result in language acquisition that lasts. Jen: 23:25 So I’m curious about what the babies think when people around them speak different languages. So what if parents speak what each of the two parents speaks different languages natively and they use English between the third bit, between them as a third language because I know that that happens with some parents. How does the child ever make head or tail with this? Dr. Hoff: 23:46 Well, we don’t know completely how they do, but again, to go back to how babies start, they look for patterns in what they hear and the patterns sort of coalesce into… The babies can tell when there’s one pattern and when there’s kind of two sub patterns in all the sounds they’re hearing, the babies do not really get confused. People used to think that there’s pretty widespread agreement that this is not a problem for babies. They can sort out which language is which fairly early now, you know, not all language pairs are the same and so Spanish and Italian might be a little harder to sort out than Spanish and English. But that’s not something that parents need to worry about. 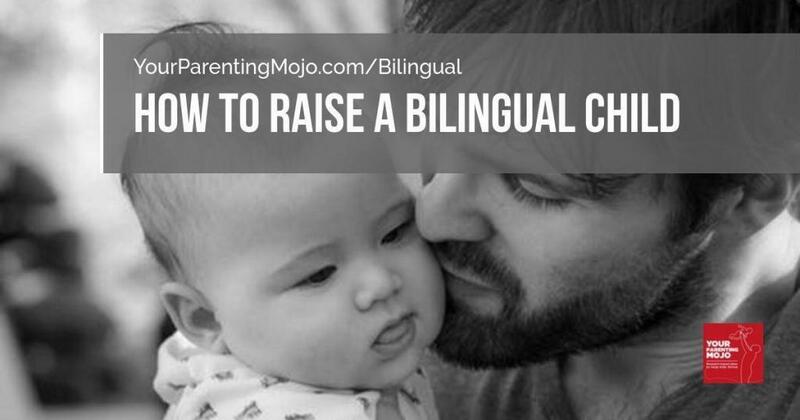 If, if you’re committed to raising a bilingual child and you have the language proficiency between you as parents, what you want to make sure you do is provide lots of exposure to both and lots of opportunities for the child to use both. Jen: 25:27 And they use words from other languages in the first language conversation, right? Dr. Hoff: 25:33 Well, you know, there’s a couple of different kinds of switching. One is just switching between two languages. The other is borrowing words and some words may be sort of borrowed on the fly and you might want to call that switching. Other words, I just absorbed into the language. So for example, in our transcripts of mother child conversation in Spanish, we here “quiero una cookie” all the time and it’s not switching languages. It’s that there isn’t a word in Spanish that really means like a Chips Ahoy chocolate chip cookie. Dr. Hoff: 26:14 No, there’s a word “galleta” but it’s a fancy pretty little thing. So where there are not good Spanish words for the things that American families are talking about in their living rooms or kitchens in the United States then they use the English word that’s the lexical borrowing of the language, which is a fine distinction, but it’s a different thing than switching languages as you speak, but both happen . Jen: 26:47 And so in terms of the size of a capillaries that children have when they’re learning two languages. This question actually came from a listener who is in the Netherlands and she speaks, I think she’s a native English speaker and her husband speaks Flemish and in schools there’s a big pressure to speak Flemish and so what she is trying to figure out is should she be concerned that her child is getting primarily exposure to English at the moment because she speaks English, maybe the child gets to preschool and all of a sudden they need Flemish, which they’re not so strong at. Would it be better to establish one language and if so, which one and the the second one later. Or should the child be trying to learn both of them at once or it seems as though from what you’ve said, that whatever language is the language of school is going to catch up really fast. Is that right? Dr. Hoff: 27:33 So no, I wouldn’t say that. Okay. I said the language of school will come to dominate, which is a a distinction. So again, you asked a bunch of questions. The language, the language that the mother should use is the language that she is strongest and most comfortable in and her child will not only learn the language as a result of their interactions, but the child will learn all sorts of information that the mother can impart in her strong language that she can’t impart in her weaker language. But how much of a disadvantage the child will be at depends upon what the child meets when the child gets to school in the United States, the school system is set up for middle class monolingual, English speaking children and children who have language competencies that differ from that are at a disadvantage whether they speak a dialect or they are just not as advanced in language or they are bilingual. Dr. Hoff: 28:45 It is a problem that is children who are learning two languages simultaneously learn each at a slower rate. That’s clear. It’s not always a well-received result, but in my data and other people’s data also it is quite clear that if you are learning two languages at the same time, you make slower progress in each. Now it’s not because the children are confused. If you add up the sum total of everything they’re learning, they’re learning as much or more than a monolingual child, but when you go to school, if Flemish is the language of the classroom, the English you know is not that helpful and then the United States, if you go to school and English is the language of the classroom. The Spanish you know is not that helpful and so children are at a disadvantage. Now in the United States. A child who speaks primarily Spanish and goes to school is likely to have a lot of other Spanish speaking children in the school and there are going to be ESL programs that are very Spanish dominant and the child is in a very Spanish environment and the school system is not set up to make that transition easy. One English speaking child in a Flemish school will have a hard time for a year, but then they will catch up. So it’s very different. If you have one child surrounded by native speakers of the other language, then that child will catch on and catch up. But when you have the immigrant circumstance and immigrant neighborhood where that one Spanish speaking child is surrounded by other Spanish speaking children than it takes much longer. So there, there isn’t an easy answer. That is one of the things that my research says quite clearly is it does take longer to acquire two languages than one if you’re doing both simultaneously and that’s not a reason not to do it. There are lots of reasons for someone to learn, you know, the, the native languages of both parents or the native language of their parents and the country in which they live. Dr. Hoff: 31:06 So I’m not saying parents shouldn’t do it and we don’t know if, you know, waiting a year, but what would you do for the year while you’re waiting; not talk to your child? I think it doesn’t make a lot of sense to engineer your communication with your child in the service of language acquisition. And forget about the whole point of language acquisition is to have a way to communicate with people. So I would just use the languages that you are best at, but if you child at the age of four or five or whatever, it’s going to have to walk into a monolingual classroom in whatever language then I think you want to pay some attention to getting the child ready for that because there’s no circumstance in which that’s easy for a child. Even when the children who catch up after a year. I mean I have friends who were in that circumstance not when they were three and four, but when they were seven and eight and they still remember it and they remember it is horrible because they were sad and lonely for a year. I think you want to try to prepare children to have the skills they need for school, but giving up on your native language is not the way to do it. Jen: 32:21 And so does the form of that preparation mean that the child spends a lot of time with Flemish speaking grandparents or friends or do you need to hire a tutor to start getting the type of school vocabulary that the child’s going to need? Dr. Hoff: 32:32 What you need is lots of exposure to rich interaction with a native speaker. How you manage that is, you know..
Jen: 32:43 …Is up to you. Yeah. Okay. Okay. And I should probably clarify it. I think at the beginning I said that, uh, that listener was in the Netherlands and I’m going to get a flood of mail saying actually she’s probably in Belgium. So just to clarify. Thank you. Okay. So you mentioned that the point of learning languages to communicate, and I taught my daughter a few words of sign language when she was about a year old because, you know, at that age they have definite wants but they don’t always have the ability to express themselves verbally yet. And it was, it was fun and it was really valuable to be able to have our tell us if she wants milk or water or something to eat. And it was awesome for her to be able to point out, you know, and tell us I see a bird, I see a plane because she was super interested in those things. Jen: 33:24 But as soon as she learned the English for those, we’ve just stopped signing. And so now if I make the sign, she has no idea what I’m trying to do. So for parents who hired a nanny who spoke a second language to the child, it seems pretty clear that once they stop being exposed to that if they do go into a monolingual English school, that they’re going to lose that Spanish. But I’m wondering is there some kind of deep recollection of that exposure that they had that makes it easier to relearn that language later on? Dr. Hoff: 33:51 There are some studies that suggest yes, but it’s really deep and there are no studies, to my knowledge that address the question of is it easier to learn later on, here’s the studies that I know of our studies of Korean babies who were adopted in France, so they had early exposure to Korean in Korea and then they were adopted and no one spoke Korean to them anymore and they became French monolinguals. Here’s the evidence that the Korean is still in their heads somehow. And that is if you do the kind of experiments where you ask, has the child completely tuned out these contrasts? So we were talking about the L/R contrast that Japanese babies learn to tune out. Well, there are some contrast. I have no idea what they are, but there are some contrast and Korean that French speakers have a hard time hearing. Dr. Hoff: 34:57 If you take… I’m remembering one particular study, but if you take these Korean international adoptees and you test them on those contrasts, I think one study said they could still do it better than than someone who’d never been exposed to Korean. And then another study found no they can’t, but they can learn it faster than someone who’d never been exposed to Korean. So if you’re asking is there any evidence that that Korean is still in the brain? There are some studies that would say yes, but no one has taken that and said okay, now if I teach you Korean, you learn it faster. I don’t think anybody would really predict that you would. Jen: 35:42 And so kind of on the flip side of that, I know that some parents will send their child to a bilingual school so they’ll learn another language even though neither of the parents speaks that language at home. So they, the child cannot use it at home unless they have siblings who were also in that school. Can parents support those children in any way? And if so, what can they do? Dr. Hoff: 35:59 They can’t, I mean they could learn a few words and so it could be a fun thing in the household for the kids to show up. They’re French or Mandarin. But in terms of really supporting the children’s and maintenance of that language, what parents can do is sort of arranged their children’s lives to have other opportunities to use that language. Just the way if you want your child to play the violin and you don’t play the violin, you get lessons, you spend that summer camp. It’s really the same sort of thing. And it’s a project, you know, one year of violin lessons when you’re an adult. It’s like, oh, I remember that, but you’re not a violin player. Dr. Hoff: 36:42 So let’s say, to go back to your original question, you have a parent who really wants their child to end up as a speaker of Mandarin or French or Spanish, and it’s not a language that either of the parents speak the first. What you want is lots of rich exposure and opportunity to use the language on a continuing basis. The research is clear there. The challenge is how do you organize a child’s life to get that? So when they’re a baby, maybe it’s a foreign nanny, but then you can’t stop there. Then if you really are committed to this project, then you have to have summer camp or Saturday afternoon lessons which exist in many communities. But of course your child has to want to do it. You can’t force a second language on a child and you know, summer camps and the child has to want to do it. Dr. Hoff: 37:43 And I really think that one of the reasons that it seems, and it is the case that Americans don’t speak a lot of other languages and other people seem to be much better able to acquire English. Well, English is a very useful language to be able to speak, and so children and teenagers all over the world have a reason to want to learn English. It’s not so clear that your child is gonna have so much of a reason to want to learn Mandarin if it’s a totally artificial thing that you just decided would be good. I mean, it’s in the same category of, you know, all the kids who once they’re old enough to stand up for themselves, say, I don’t want to take violin lessons anymore. So yeah, I mean the brain will do it, but it requires a certain kind of environment that can be difficult to arrange and sustain. Jen: 38:42 Yeah. It reminds me of research that I’ve done on what motivates children to learn and I found that they basically need to be developmentally ready, which I think children are developmentally ready to learn language, but they also have to be motivated and if they don’t see that it’s important than they won’t learn it. Is that right? Jen: 39:45 We don’t do that. Dr. Hoff: 39:50 Okay, so the, this, this next question is a key concern. I think you have parents who do speak a second language fluently. I have a friend who speaks Spanish fluently and it’s important to her that her children understand and speak Spanish, but whenever she speaks to them in Spanish, they answer in English. And my husband does the same. You know, he was raised in a Tagalog-speaking household from very early on and he now understands two different dialects of it. He can’t speak a word of it. So is it kind of the beginning of the end for that second language in terms of being able to speak it fluently when the child starts answering in English or is there anything the parent can do to kind of rescue that situation? Dr. Hoff: 40:25 Well, we actually have a study coming out that shows exactly that, that the more that children do that kind of answering in the other language, the slower they are development of that language is and the result is you have seen is passive bilingualism and well, again, here’s the problem. So one clear implication is don’t allow the child to answer in English if you want them to learn Spanish, but if their English is much better and they know you understand English and they’re trying to communicate with you, then it’s kind of weird to tell you “don’t speak it.” Well, some people do. When you read, when you read the proud stories of people who are successful, you know they have rules of, no, we’re only speak French at home and you have to answer me in French and you have to come home from school that was in English and tell me about it in French and there are families that have those rules and it’s very good for their children’s acquisition of French. Dr. Hoff: 41:30 But as a developmental psychologist seems like, I don’t know if my child is in front of me and trying to communicate something to me, I want to understand that and to sacrifice that in the service of becoming bilingual seems a little odd and I would even say kind of misguided. So what you need to do, and again, easier said than done, is to engineer a circumstance in which the child has to speak Spanish. So find a monolingual Spanish environment and the child isn’t going to answer in English to somebody who doesn’t understand English, but if as long as you understand English, what they’re doing is in terms of communication, a very reasonable behavior and it would be kind of odd of you not to allow it. Dr. Hoff: 43:17 Right, but it’s nicer and easier than sending you off to boarding school or what happens to immigrant children; they get sent to school in English because in school you can really fail. I mean there are real. They are unfortunate consequences of not being good enough in English. Whereas it’s summer camp, I don’t. I mean I’m making this up. I don’t know, maybe she wasn’t very happy for a while, but it seems like the, the life long consequences of taking awhile to catch up would be less severe in summer camp than in school. But now you know, we’re talking about something that affluent people can do. It’s not a plan for world bilingualism. Jen: 44:05 It is not. Okay. So one thing I’ve read a little bit about in the literature and I’m really curious about is whether they’re a cognitive benefits to learning a second language as a child, besides the actual knowledge of the language itself. Dr. Hoff: 44:20 That’s a very controversial area. There are good people and good research that say yes, but there are lots of people who are not as convinced. I just came back from a conference where this was a really a hot topic and I think that the conclusion from the meeting on this particular topic was it’s clear that there are certain kinds of cognitive skills we call them executive function skills that are related to language skill. So if you’re good in one you’re likely to be good in the either which is the cause and which is the consequences not as clear. So one of the things about bilinguals – there are many studies that find bilinguals to be stronger in executive function skills, but whether the bilingualism made them that way or whether they became bilingual because that’s part of their ability is not always clear. I mean, I think there are personally I would believe there are some cognitive benefits of being bilingual. I think the research suggests that it’s not enough to have learned another language once, but rather than benefits arise from using two languages on a regular basis. Jen: 46:38 Another darn it! Jen: 47:21 Okay, so in a way, I think you may have answered my last question, which is that I know I speak very proper English, not American, although it’s becoming more Americanized English and I speak some conversational French with a really horrific English accent and my husband obviously speaks fluent English and two to two dialects of Tagalog and he cannot tell them apart and he doesn’t speak either of them, so we have no plans to teach our daughter a second language right now or anytime soon and so are we terrible parents and it seems as though you’re saying I’m not a terrible parent. Could you provide some evidence to back that up? Dr. Hoff: 47:55 You’re not a terrible parent at all and you can comfort yourself with two kinds of thoughts. One is if you tried to teach your child and other language, unless you’re really committed a lot of time and energy and resources to it, it probably wouldn’t be sustainable for very long. And the second thing is there’s all sorts of other things you can do to give your child the kind of benefits of another language and actually a third thing is although there are unique advantages to being a young language learner, it’s never too late and if your child has good language instruction in school, I mean, if you think this is an advantage you want to give your child. You don’t have to start at home before the age of three. There are many other ways to do it and it’s… I don’t know…it might be a little too late for me, but certainly certainly a child in elementary school or high school or even actually I have a friend who’s a fluent speaker of Mandarin and she learned it when she went there to teach English in her twenties. And so it’s not as though you are abandoning your, your child and you’re giving up on any hope of your child ever being a fluent bilingual at all. Jen: 49:18 Okay. Great. Evidence that I’m not a terrible parent. Always welcome on this show. Well Dr. Hoff . Thank you so much for taking the time to speak with us and to dispel so many myths about raising bilingual children. I know that my listeners are going to get so much out of this episode. Dr. Hoff: 49:34 It was a pleasure. I only stumbled upon your blog a short while ago and love it. This episode is very interesting to me as I am a German raising my two children in Australia. I would have loved some insight into warning signs that the bilingual language development is not going well. For example my daughter is 3 now, should she be switching back and forth most of the time or is it ok that she mixes her sentences. Are there resources for parents that want to track language milestones for their bilingual children? Thank you for all the insight you are giving me! Hi Henrike – I’m glad you found this episode useful. In general, you will know that bilingual language development is not going well if your child resists speaking one of their languages. This typically tends to happen when they start school; whatever language is used among friends becomes the ‘cool’ language and the other is resisted. This is why so many Latino/a children in America understand Spanish fluently but don’t speak it – because they had to speak English in school and they wanted to speak it with their peers. To combat this, parents need to make speaking the second language (a) cool; (b) necessary; or (c) both. If you spoke poor English (which you clearly don’t), they would have to retain German to speak with you. If they happened to get shipped off to their German (non-English speaking?) grandparents for the holidays, this would probably help as well. If there’s a German ex-pat community with kids, you could try and get involved in that group. From what I’ve read it’s fine if your daughter mixes her sentences – even adults fluent in more than one language do this when they’re with a person who understands both languages. Good luck!